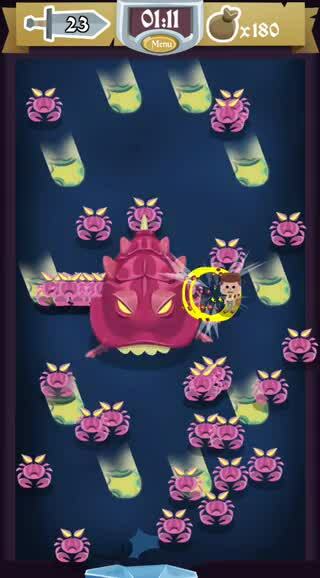 BlitzKeep ($3.99) by Elijah Delventhal is a fantastic new arcade game that is a hybrid of pinball game and RPG. 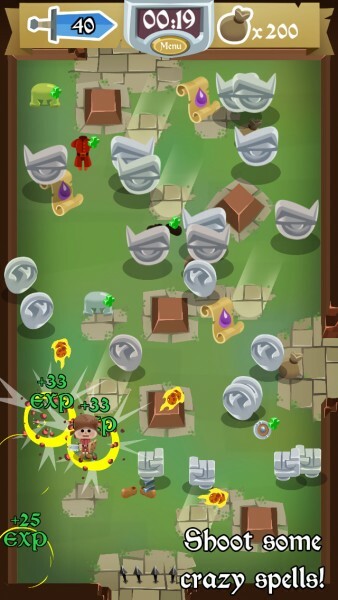 If you enjoy games that combine genres that you never thought would go together, then BlitzKeep is definitely worth checking out. 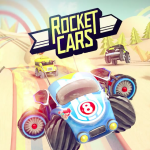 As much as I love iOS gaming, sometimes I just feel that the App Store is filled with a ton of clones of each other. It’s hard to find something original in the store anymore, which is why I get so surprised when I see developers who come up with their own original concepts. I had no idea of BlitzKeep until I saw it on the App Store last night, and so far, I’m impressed with this interesting mashup. The visuals in the game look gorgeous and have that classic RPG feel to them, so it’s definitely eye-catching. The different environments are bright, colorful, and lush, with plenty of fine details that you’ll notice as you play and die (this will happen a lot). Your character’s appearance also changes as you collect useful pieces of armor, so there is a sense of progression as you bounce around. 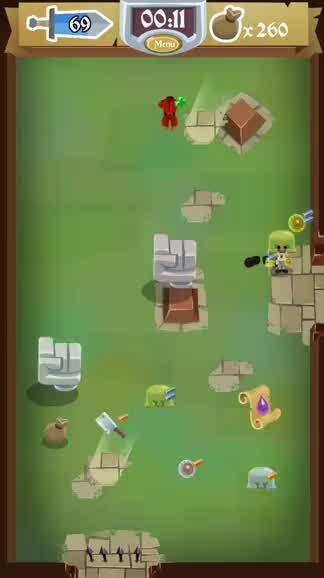 The animations in BlitzKeep are smooth and fluid, with no lag on my iPhone 6. The soundtrack takes on an adventurous tone, so it is perfect as you ricochet around the rooms and lay waste to groups of enemies. The sound effects are a nice touch too. The story of BlitzKeep goes something like this: your main character comes from a long line of heroes and even has the blood of heroes within him. His homeland was taken away by the evil Blitz Mage, who has cursed the entire island. What’s the curse? It’s darkness, so if you want to save your island and kin, you have to keep moving, because the darkness will turn anyone who stands in it into a monster. There are 10 kingdoms that you will have to traverse through on the journey to save the island, with the difficulty increasing gradually in each one. At the moment, there are actually only five available, with the other five coming in a future update. Be warned though — you will die a lot, but getting back in the game takes only mere seconds. Each kingdom consists of rooms that are connected to each other, and you must get from the entrance to the last room of the kingdom, where you face off against a colossal boss. 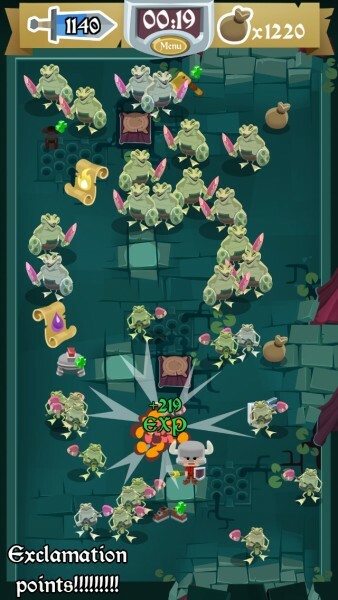 However, this is no easy feat, as each room is filled with dozens of smaller enemies that only get bigger and stronger as you go from room-to-room. To increase your power, you have to beat the smallest and weakest monsters first before going for the bigger ones. The controls in the game are simple and intuitive. Just tap on the spot where you want your hero to go, and he will glide on over there. Since this is a pinball or pachinko game mechanic, you won’t stop until you reach a safe spot or move on to the next room. And if you take too long (keep an eye on the timer at the top), the darkness will overcome you and you’ll have to start over from the beginning of that kingdom. When you hit a wall or obstacle, your hero just bounces off and keeps going until he gets to a safe spot. As I mentioned, you have to start out with the weaker enemies before moving on to the bigger ones. This is because your character has a certain amount of power (your “POW” is shown at the top), and enemies have their own power levels too. If your power is equal or greater than the foe, then you will kill them upon contact. However, if the enemy has a higher power, then you’ll die if you run into them. 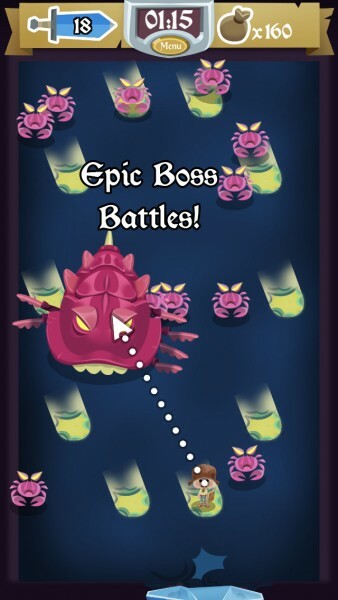 Bosses will have a fairly high level of power when you reach them, so make sure to kill as many enemies as you can for experience (your power increases with level) and items to boost your stats. When you beat a kingdom, your power level remains at the same point when you cleared it, so as you advance in the game, you continue to get stronger. But if you keep dying on an area, your power level resets to what it was when you started, so you just have to keep at it. You’ll acquire coins as you play, even if you die, which is nice. 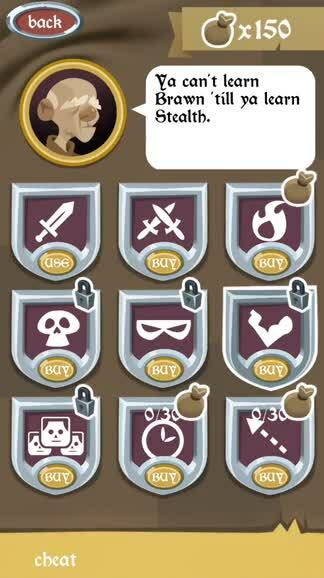 The coins can be spent in the shop for useful upgrades for your character, such as new physical and magical attacks, more power and speed, and much more. With these as incentives, you’ll have plenty of reason to keep playing. I’m pleasantly surprised with BlitzKeep, and it’s one of my favorite new game releases this week. The graphics are beautiful, the soundtrack gets you pumped up for battle, and the controls are as simple as they come. The upgrades are nice motivation, and the game itself is fairly challenging. I just wish that there was some kind of Game Center integration, because something like this would have made for some great leaderboard competition. Achievements would have been nice too. 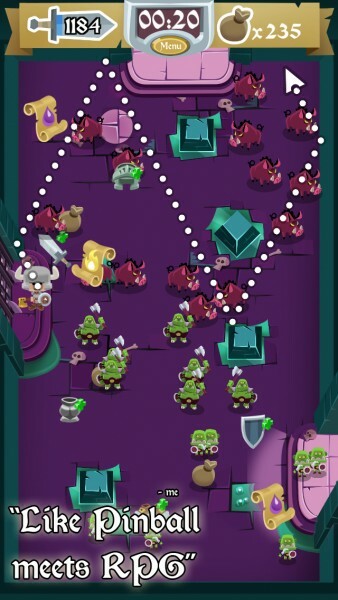 I highly recommend checking out BlitzKeep if you’re in the mood for a unique and addictive mixture of pinball and RPG in one game. 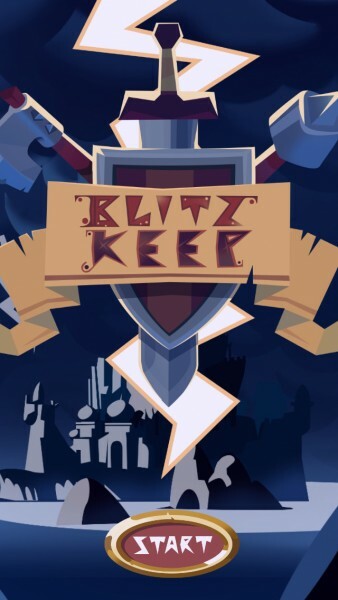 BlitzKeep can be found on the App Store as a universal download for $3.99.